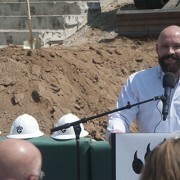 Fresno Grizzlies (Class AAA; Pacific Coast League) team president Derek Franks has been added to the franchise’s ownership group, Fresno Sports and Events LLC announced Thursday. Franks is entering his 16th season with the Grizzlies. The Central Valley native began his tenure with the club in 2004 as an intern and progressed through the sales ranks, eventually becoming Executive Vice President and General Manager of the organization in March 2014. In 2015, Franks was named Pacific Coast League Executive of The Year as general manager, and was promoted to president upon Fresno Sports and Events assuming control in February 2018. With $3.4 million in capital improvements in motion at Chukchansi Park, for just the 2019 season alone Franks and the front office are overseeing the opening of a new left field social space and lounge (a premium area without premium pricing, open to any fan with a ticket), a re-done club level with “The Kodiak Club presented by KY Farming” launching on April 4 (Opening Day), and a new kid’s play area and “splash park” that is currently under construction on the right field side of the stadium. Born in Avenal, CA, Franks attended Kingsburg High School and graduated from Fresno State in 2006. Under his leadership in 2014, the Grizzlies set a single-season merchandise revenue record at the time, and earned the highest grossing single-game ticket and corporate sales marks since 2008. Over five full seasons as the club’s top executive, Franks has overseen a continued bolstering of the Fresno Grizzlies and “Fresno Tacos” brand both in Central California and nationwide; with 2016 setting a new bar thanks to another all-time merchandise sales record for the franchise. Under Franks’ leadership, the Fresno Grizzlies have grown from a regional brand to trend-setters in the world of minor league sports, as their giveaways, theme nights and philanthropy continue to garner national attention as each season takes shape. In 2018, the organization made a splash with most beers in Chukchansi Park being reduced in price to only five dollars, easily the lowest beer price in all of Triple-A or Major League Baseball, with a hyper-focus on fan experience for all ages.